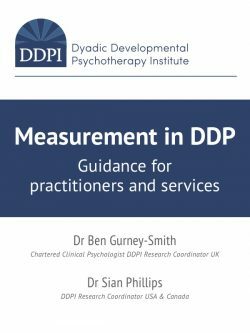 DDPI is pleased to announce the publication of Measurement in DDP: Guidance for practitioners and services. Developed by Dr. Ben Gurney-Smith and Dr. Sian Phillips, this guidance is designed to encourage the evaluation and understanding of DDP in a range of settings but in line with the core elements of the model. Developing the evidence base for DDP continues; a critical part of this challenge is the selection of appropriate measures which DDP sets to influence. Therefore the DDP Institute have published a guidance document to assist practitioners and services in their evaluations of DDP informed practice and DDP. We believe this will be of interest to many. This is available now and is based on an understanding of the literature, the fundamental theories which DDP is based, practice wisdom and the outcome research to date. The document is available to download and can be found in the DDP Library. Keen to encourage and support the development of an evidence base for DDP, the DDPI are offering support to those interested in measuring change following DDP, available in the UK, USA and Canada. Please contact Matt Hudson (Assistant Psychologist) matt@ddpnetwork.org who will email the relevant Research Coordinator to your country.